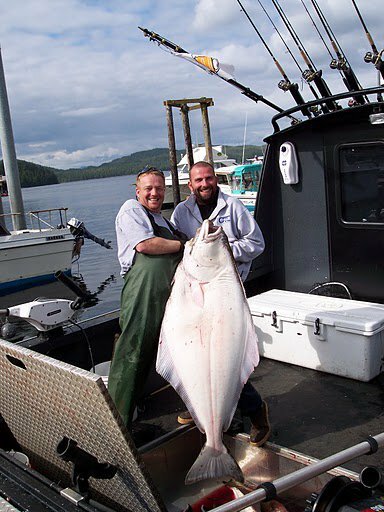 Ketchikan Fish Co. is a group of seasoned fishing guides who run fully guided fishing charters out of Ketchikan Alaska. All Fish Co captains are Owner/Operators and have similar ideas about maintaining boats to the highest degree of safety and performance. We hold a deep passion for fishing and helping others experience the joy of fishing in Alaska. We work together to make sure we all know where the best fishing is and what techniques are working best for catching both Halibut and Salmon. Ketchikan is a busy port city on the Alaskan Inside Passage. During the summer months, as many as five cruise ships may be in town on any given day. Because Ketchikan is such a remarkable fishing destination, hundreds of travelers from around the world try their luck each day of the summer. Many large family and corporate groups find it difficult to take their whole group fishing with one fishing charter company. Many Captains are a single boat operation and may only be able to refer your group to another boat. Unlike other operations, we share a schedule and can book directly to the boats within our group. This means one contact with us, and we can handle your group of up to 30 passengers. We are independent operators working together to give you confidence and ease of access when booking a fishing charter in Ketchikan. Ketchikan Fish Co. boats are located downtown near the cruise ship docks. With us, there are no bus, van, or taxi rides. We meet your group right at the ship. You will be greeted by the Captain of the boat, not a dock agent, and your fishing trip will begin immediately. All of the Captains are available by phone or email prior to your arrival. We like to have a dialogue with our guests prior to arrival so that we know what you want to experience and what we can do to make your trip better. It also helps to feel like we are meeting a friend at the ship rather than just another name, and we think you will enjoy our approach as well! We want to encourage you to look around at our boats and our captain profiles and please feel free to contact any of us with questions or to book a charter.